Physiological measurements, also referred to as biometrics, consist of various sensors that measure the activity in bodily systems in response to things that are experienced through our senses or imagined. This can be direct measurement of the central nervous system (e.g., the brain) or organs that are connected to the peripheral nervous system (e.g., the pupils of the eyes, sweat glands in our skin). The goal of biometrics generally is to measure bodily responses that are more direct indicators of emotional states. Determining the degree of mental effort being expended is another common use of biometric measurements. 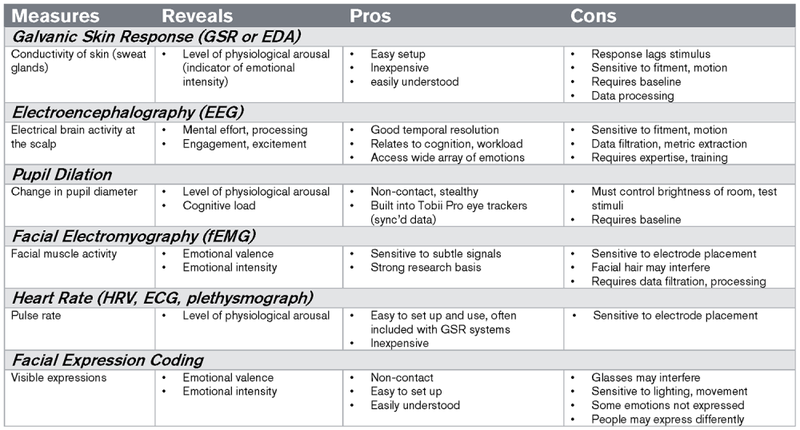 To help researchers curious about what biometrics might add to their work, we have prepared an informative table that describes what each biometric technique measures, what the response indicates, and some pros and cons of each.